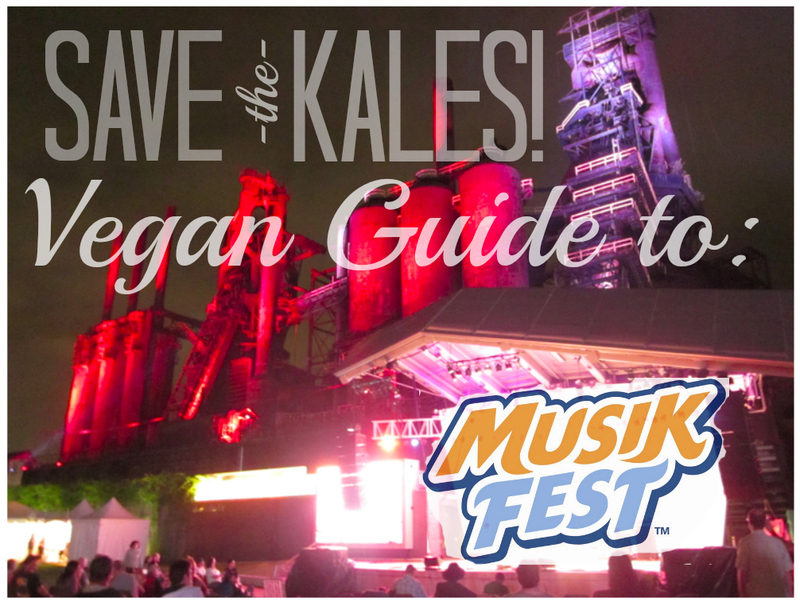 vegetarian musikfest | Save the Kales! 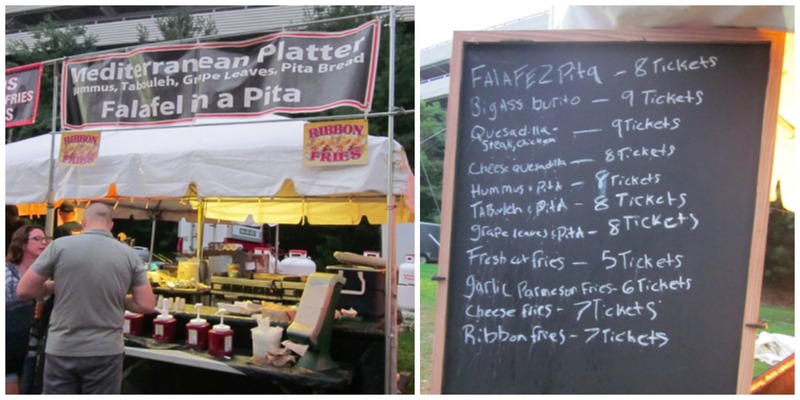 VEG FOOD AND MUSIKFEST 2011: You Won’t Starve! 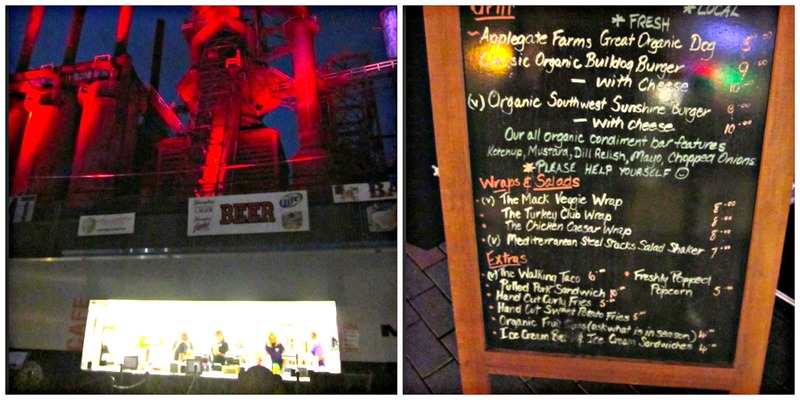 Among all the turkey legs and gyro meat spinning six feet in the air, there are some vegetarian and vegan meals to be found among the Musikfest vendors. This this is in no way comprehensive – you can find fried things all over the place so I didn’t highlight the obvious stuff (french fries). Overall, I found that the areas that have the most veg-friendly food are Broad Street around the Boyd Theatre, Main Street, and the area down the hill right behind Hotel Bethlehem. Once you’re down the hill but start moving under the bridge toward Plaza Tropical, you’re options get limited to mostly aforementioned fried things. **As of the time of this post, I haven’t been in the kid’s area or to the vendors around the back of it, so I’ll check that out soon. In the mean time, if there’s something great over there that I’m missing, please let me know! On Broad Street, there is Hello Burrito open for business as usual (look for the guy at front handing out 10% off coupons!). Most burritos start vegetarian, and can be made vegan upon request. Something new is Istanbul Grille, mediterranean food that is very inexpensive: grape leaves 2/$1.00, falafel, etc… And it looks like a brick-and-mortar restaurant is coming soon. 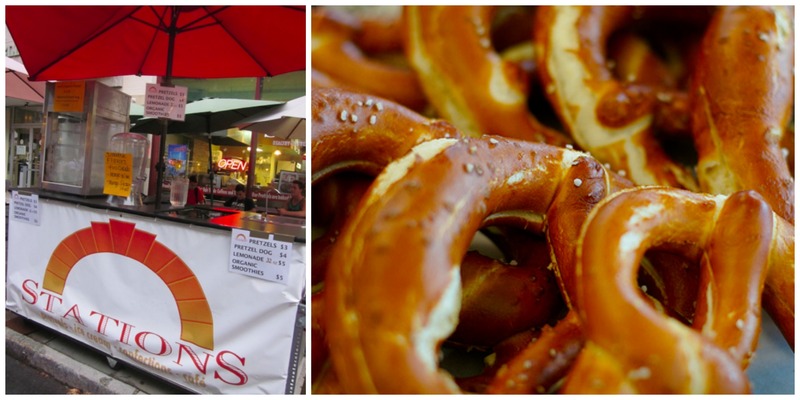 Across from that, Stations has a stand set up for their organic soft pretzels that are VERY TASTY. 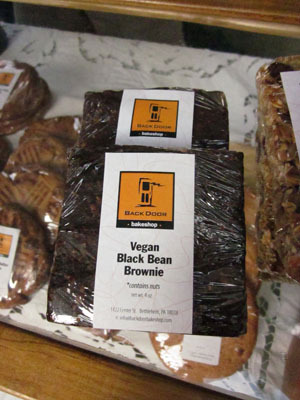 They have a brick-and-mortar business in the Main Street Commons, and will also be vending at VegFest. Show some support! 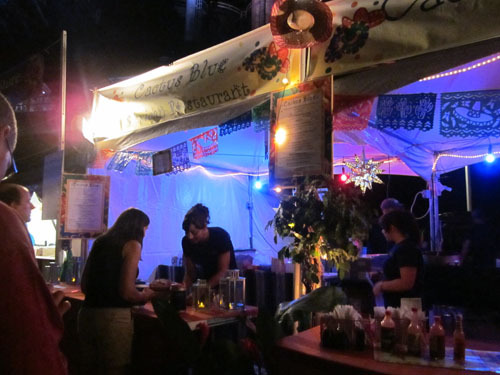 Keep an eye on Main Street for Take-A-Taco, serving vegetarian quesadillas (and I’m sure they’d leave the cheese out if asked). 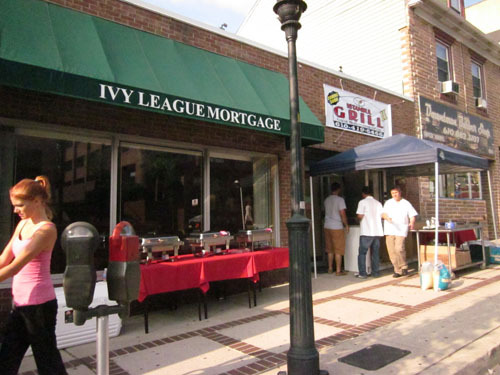 In front of Johnny’s Bagels you’ll find veg*n gyros, veggie burgers (not sure if these are vegan), and falafel. 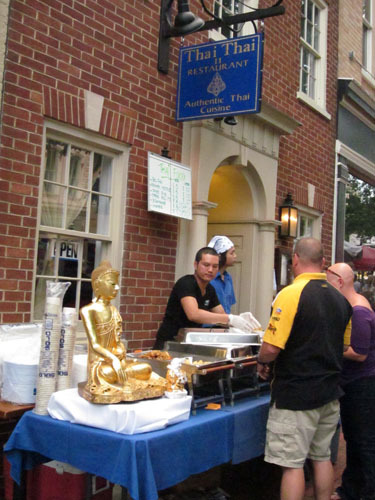 Thai Thai II, one of my favorite local restaurants, also has vendor food in front of their place on Main Street. EVERYTHING they are serving is vegetarian. I stupidly forgot to ask if their food includes eggs, so I don’t know if it’s vegan or not. I’m hoping so, because nothing is over $5 (cash only, no tickets here) and they have pad thai and drunken noodles. I LOVE DRUNKEN NOODLES. SO MUCH. (They don’t actually have alcohol in them for my straight edge buds.) Also spring rolls and edamame. Don’t miss the little gem hiding at the Sun Inn Courtyard, just off Main Street. 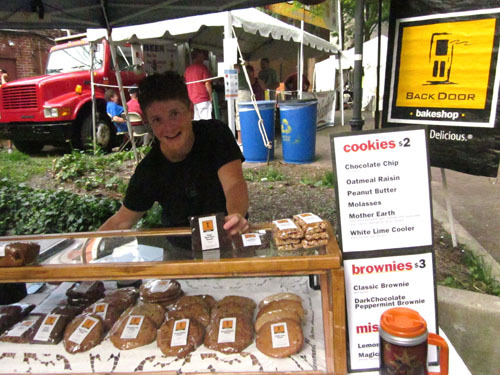 There you’ll find the always pleasant and wonderful Gail of The Back Door Bakeshop with her awesome vegan black bean brownies! She’s great, local, and cooking up some new vegan recipes in time for VegFest. If you’re really lucky, the fabulous Dina Hall will be there too when she’s not playing a show. Thanks for feeding us, Gail! 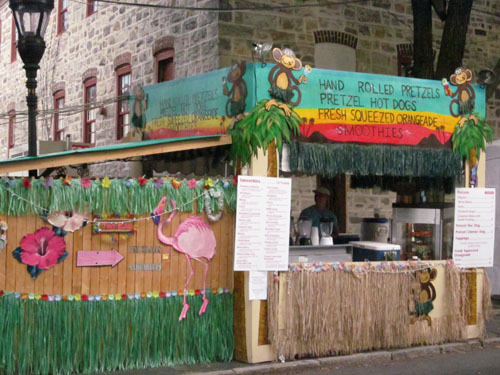 Once you get down the hill behind the Hotel Bethlehem, stay to the right if you’re hungry. 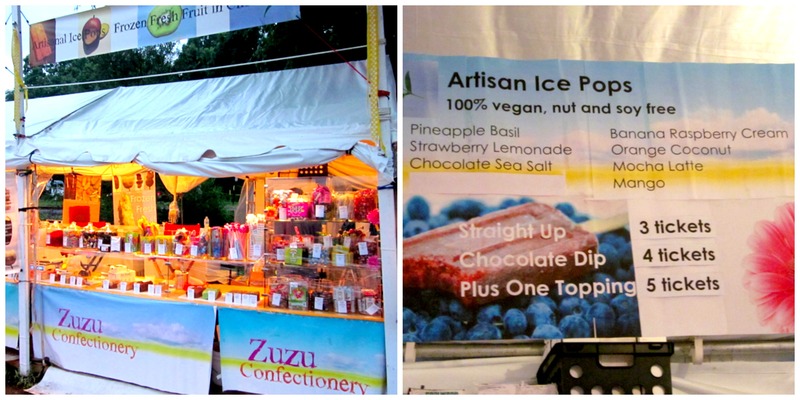 You’ll find the vendor offering pickle on a stick (not fried), which is a mere dollar but the pickles are tiny. 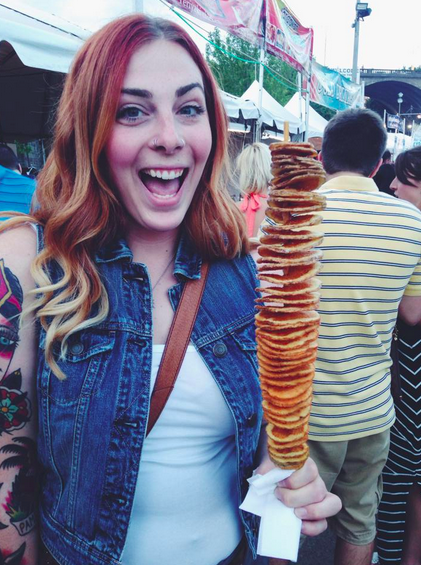 It’s still fun to eat them off a stick, though. 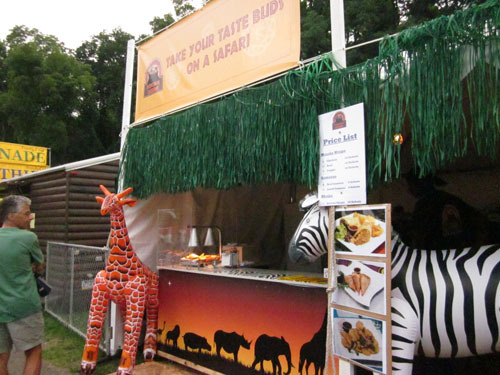 What may arguably be one of the other biggest veg-food saviors of Musikfest is Alando’s Kenyan Cuisine, just look for the giant zebra. 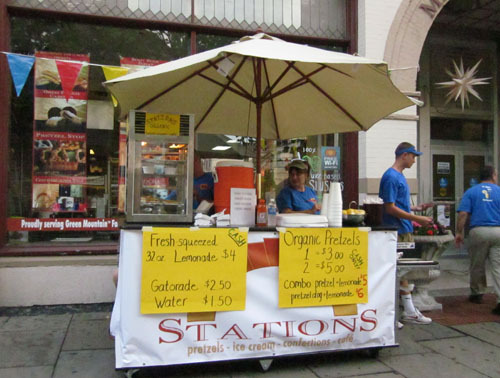 While their restaurant on Main Street is open during Musikfest, at their booth you can pick up some awesome lentil samosas (make sure you get the spicy pili pili sauce on the side! ), and vegetable masala wraps (ask for no Ranch dressing). 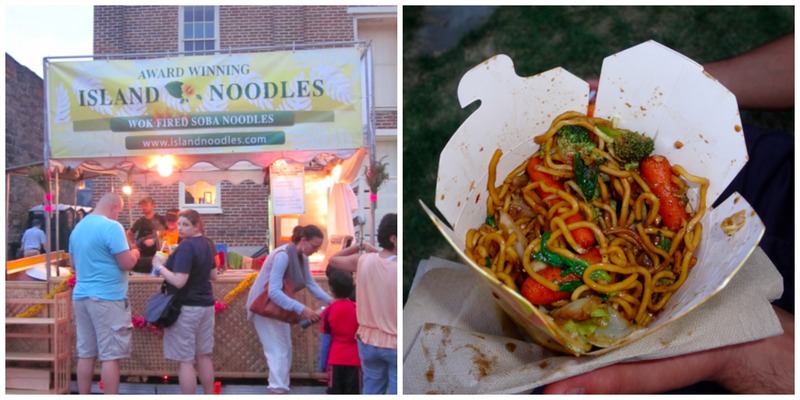 Stroll around and you’ll also find Chan’s chinese food, with veggie lo mein. 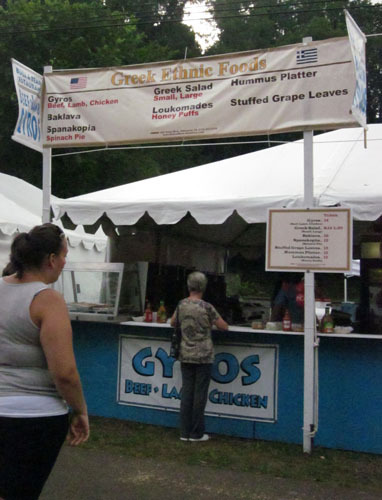 There’s also a Greek Food stand with grape leaves, a hummus platter, and spinach pies (not sure if they have cheese or not). If you get over to Steelstacks, there is a bright shiny star of food stands on that campus too. 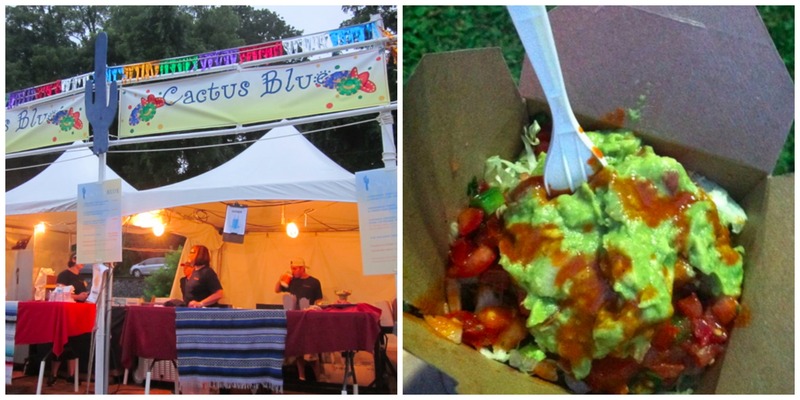 Cactus Blue mexican food is very vegetarian and vegan friendly. And more than that, it’s really important to them to be a veg-destination. One of the owners, Liz, is one of my former college professors. She told a story about her vegetarian mother having such a hard time finding food as Liz was growing up, people always wanting to give her mom chicken or fish as a “vegetarian” dish. So when Cactus Blue opened their restaurant, they made sure that everything (except a blatant meat dish) could be made vegetarian or vegan. 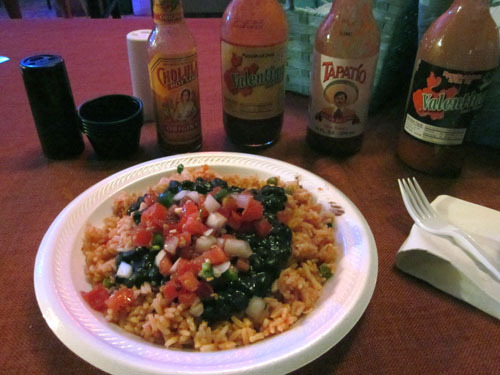 Beans and rice are free of animal products and broth, and they have yummy fresh salsa and my favorite, a variety of hot sauces to use. You can get this tasty plate of rice and beans for $5 worth of tickets. I’ll continue to update this post as you or I find things to add to it, so don’t be shy about sharing your favorite places to grab some food, and photos are great too. Happy Festing! 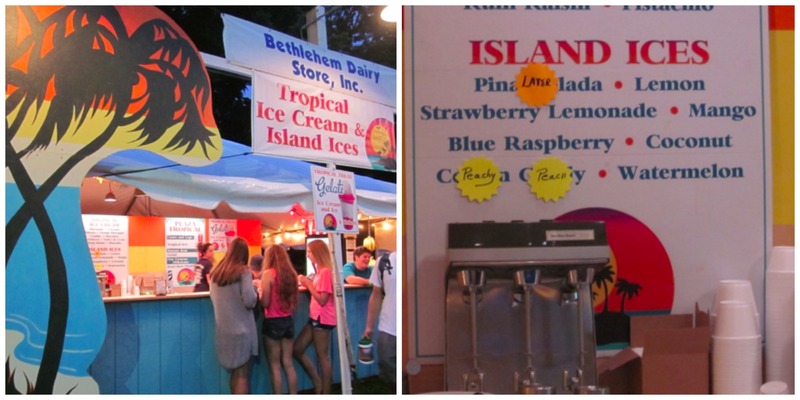 For those of you living outside the Lehigh Valley, here’s the thing: My little town of Bethlehem, PA becomes a MASSIVE MUSIC FESTIVAL every August. It’s 10 days long, (mostly) free performances, has over 10 stages (called “platzes”), food and art vendors everywhere, AND for those of you who imbibe now and again, you can drink beer, wine and alcohol in the streets. If you live downtown (I do), you can gripe about finding parking in front of your house and how annoying the mobs of teenagers are. Or you can shift your perspective and take advantage of the fact that you get to see free live music from across the country (and the world, in some cases) and join the party! It’s true that I’m not familiar with 90% of the bands. But to help you out, I’ve poked around online to find some highlights. Not sure if you’ll like them – I’ve been into jazz and bluegrassy/old-timey stuff in the last year – but if you are wandering among the masses, here’s a guide to what musicians sparked my interest the most. EVERY ONE of these performances is FREE! 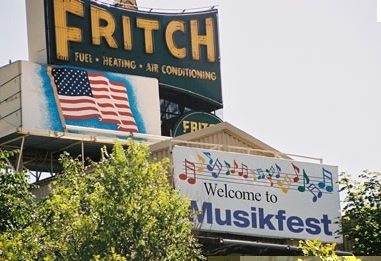 *NOTE: Please grab a Musikfest guide or check the website for platz locations. Also, check out the bands yourself online since it’s a lot of work to come up with descriptions of them. All are intriguing, but the bands/musicians in bold are REALLY FANTASTIC! Like, I’m sort of mad that I didn’t know about them earlier. Or, if you don’t go you are missing out and you can’t ever complain about Musikfest. Please check out the girl in this video the Love Revival Revolution – oh my gosh!!! 9pm Start Making Sense; Volksplatz TALKING HEADS TRIBUTE, OH MY GOSH AMAZING AND LOCAL!!!! I’m going to work on a guide to vegan food once I get there and check it out. PLEASE let me know if you have any tips on vegan food, and photos would be great, too! You can post them on FACEBOOK and I’ll add them to a blog post!